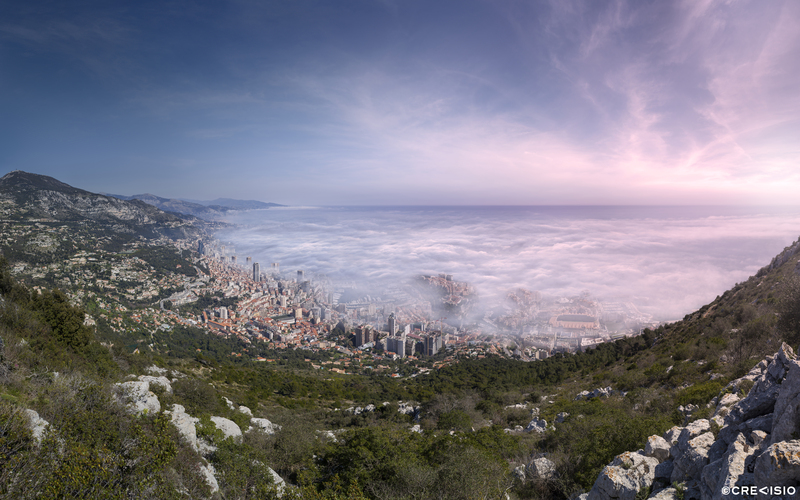 Ultra high resolution panorama of fog appearing low over the Principality of Monaco. A very rare and unusual phenomenon occured on March 30, 2017, when a layer of very low clouds of fog moved towards the shore from the sea, and then found its way West along the coast. The 270 megapixel photograph has a full resolution of 20,800 x 13,000 pixels at 300 dpi. You may download a free wallpaper version for personal use by clicking the photo above or the link on the side. For commercial use, please contact Crevisio.